36th Marathon Franja BTC City invites you to Pony relay race for teams of three this year • BTC d.d. Marathon Franja BTC City is part of the World Marathon Series UWCT Gran Fondo. In 35 years, the Marathon attracted over 100,000 officially registered cyclists from more than 42 countries across the world. This year, at the 36th edition of the Marathon, the organisers are expecting to see the participation of over 7,000 racers and more than 1,800 members of accompanying teams. Marathon Franja BTC City, held during a weekend in June, will offer the already well-known races: Big Marathon Franja BTC City (156 km), Triglav Little Marathon Franja (97 km), time trial (22/44 km), Hofer Family-School Marathon for everyone (22 km), and Vzajemna Children’s Marathon (1.2 km). A novelty is the relay race for teams of three with Pony bikes (2.4 km), in which teams of three will race with the legendary Pony bikes, each team including at least one female racer. Another novelty in the programme is the flying start of Little and Big Marathon Franja in BTC City Ljubljana. This will make this cycling event even more similar to other big marathons, where you do not need to ride in a tight peloton through the city. This year’s Franja will not only be relished by racers, but by all event visitors as well. We should mention the presentation of the project Okusi Ljubljane and the brand Okusni Bluz – Food Bluz. BTC City Ljubljana, as a city of shopping, is developing a wholesome gastronomic and culinary offer by including dishes from the entire Slovenia and across the world. The brand Okusni Bluz – Food Bluz combines more than 70 restaurants, bars, a market and nutrition stores, topping off its offer with various cuisines. 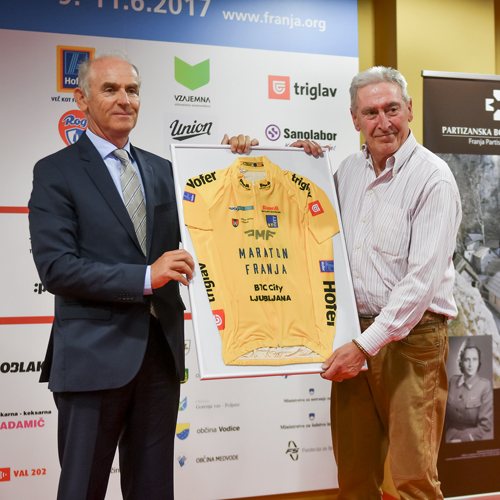 For the second consecutive year, the cycling spirit of Franja is intertwined in the project My Sport is Franja, a project that represents an upgrade to Marathon Franja BTC City on a European level. In the scope of the project, this May we saw family marathons held along Lake Wörthersee in Austria, in Italian Cormons, and in Slovenian Goriška Brda region along with cultural events and the tastings of local culinary delights. The final event – Academy Franja – will take place in BTC City Ljubljana in October this year.